An equestrian homeowner lets a trusted designer take the reins in appointing her weekend home, and the result is a blue ribbon-worthy best in show. 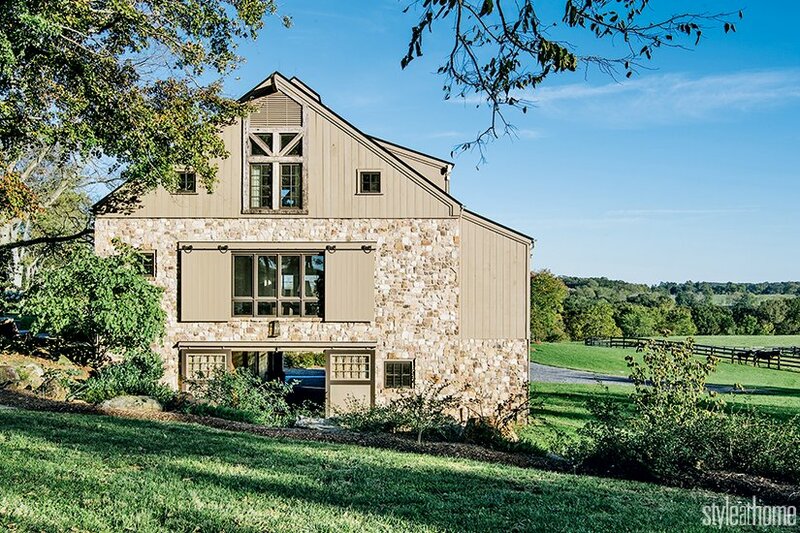 While this rustic weekend retreat in Upperville, Va., is all about relaxing and letting loose, the real horsing around takes place outdoors on its bucolic 500-acre property. The homeowner, an accomplished equestrian who keeps and breeds horses, had the 3,000-square-foot one-bedroom dwelling built in 2013 with stables beneath it, so her main loves – her horses – are always close when she’s there. Modelled on a historic bank barn (which is set into the side of a hill), the home feels private and protected yet boasts sprawling views of the lovely landscape. Completely open concept and teeming with light, the main rooms offer stunning glimpses of the outdoors from almost every corner. It’s an interior that truly honours its exterior, almost inviting it in as a design element. The homeowner’s lifestyle, and the fact that she frequently hosts guests, also played an important part in determining furniture selection, as well as overall layout. “We wanted to create different conversation areas where she could entertain any number of friends,” says Marlene, citing as examples the 14-foot dining table (perfect for a large formal dinner) and the reclaimed wood-topped kitchen island (where the homeowner enjoys smaller casual gatherings with guests perched on stools). There’s also plenty of seating in the living room (not shown). One sitting area is defined by three tailored leather sofas set around an oversized cocktail table, and the other features four club chairs around a metal drum table. The open plan is perfect for entertaining groups of all sizes, but as a bonus, barn doors can be used to close off the home’s more intimate spaces, such as the office, den and bedroom suite at one end of the second-floor catwalk balcony. It’s a house in which one can live both large and small. “This home was originally intended to be a guest house,” says Marlene, “but once it was complete, the owner couldn’t imagine staying anywhere else on the property.” She knew the refined rustic escape, close to her horses, was where she wanted to be. This barn-like structure was built into the side of a hill with four stalls for horses beneath, which can be accessed from the home by an interior stairwell. The entryway announces the modern country style of the home with its stunning juxtaposition of hand-hewn reclaimed wood beams, an ornately carved antique chest, a casually leaned minimal mirror and tropical foliage. A dramatic wrought-iron chandelier hangs above a stately dining table that seats up to 16 – the perfect foil for the rustic envelope of this horse lover’s retreat in Upperville, Va. The wingback dining room end chairs are upholstered in a hard-wearing wool plaid that plays into this weekend retreat’s subtle equestrian theme. Plaid is repeated throughout the home, as are classic tweed, leather and herringbone. Country meets contemporary in the bright open kitchen, from the Shaker-style cabinetry, salvaged wood-topped island and farmhouse apron sink to the sleek lantern-style light fixture and stainless steel mosaic backsplash. In the master bedroom, a contemporary take on the four-poster bed boasts a tufted leather headboard for comfort and continuity with the downstairs rooms. © 2018 TVA Group. All rights reserved. Great closets make getting dressed a grand affair.